After signing it, Gov. Gary Herbert holds up a copy of a bill at the Capitol, Thursday, March 12, 2015, in Salt Lake City. The bill that protects Utah’s LGBT residents while also ensuring religious rights became law amid a cheering crowd that contained both clergy and gay rights activists. SALT LAKE CITY — Gov. Gary Herbert on Thursday signed into law an anti-discrimination measure that earned the support of the Mormon church amid a crowd that brought smiling clergy members together with LGBT activists draped in rainbow flags. Hundreds of people packed the rotunda and the staircase behind the governor to witness the unusual public signing ceremony Thursday night. The crowd roared when Herbert proudly held up a freshly inked copy of the bill. 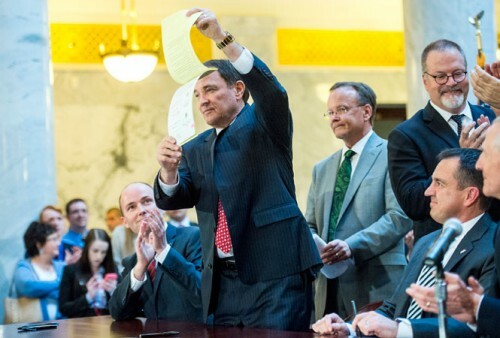 Herbert’s signature was the final step for the proposal, which flew through the Legislature after it was unveiled last week with the endorsement of the Utah-based Church of Jesus Christ of Latter-day Saints. Many Utah lawmakers and the Republican governor are members of the church. The law protects lesbian, gay, bisexual and transgender residents from discrimination in housing and employment — a step activists have been pushing for years — while also creating exemptions for religious organizations and protecting religious speech in the workplace. The governor’s decision to sign the bill before the legislative session had ended was rare, demonstrating the importance state officials have given a bill they believe could serve as a model for other states grappling with how to reconcile gay rights and religious rights.